I've noticed a variation on the mulch mound recently- the bowl of mulch. Better than mulch against the crown & trunk I guess, but wouldn't it trap too much water against the tree perhaps ? It certainly looks like it is too thick.....encouraging the roots to travel through the mulch instead of the soil beneath. 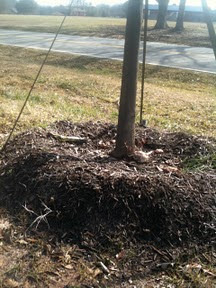 This is bad as the roots will dry out too quickly and additionally not have the nutrients it needs from mulch. I think usually it settles... but it does look thick. Mulch is great, but can be highly acidic, and I think people use too much of it. In my opinion its just too manicured looking, but a little never hurts. I don't think it settles. This is only occurs for two reasons, both intentionally but on is good and one is bad. Good reason: A new tree. You want to "bowl" the soil like this and mulch on top of it to, as you said, trap the water in until the new tree gets established. (Then you smooth it out). Bad Reason: The contractor or homeowner gets lazy--Let me explain. After a couple years of mulching, and mulching again, the mulch builds up. In a small mulch ring like this there's no where to spread out the build up--and you're right, you don't want it right up against the bast of the tree or it will rot the tree! So they drag it out to the edge there and therefore creating the bowl. Soulution: Either make the bed around the tree biger and spread the mess out, or get the wheelbarrow and relieve that tree of some of that stress!